Tag line: "Ask yourself if you're really happy"
Director Jill Sprecher’s 13 Conversations About One Thing follows the lives of several people, all of whom are searching for a happiness that, unfortunately, is nowhere to be found. Troy (Matthew McConaughey) is a District Attorney who’s at a bar celebrating his most recent conviction, which put a murderer away for a long time. On his way home that evening, he hits a young girl with his car. Realizing he’d been drinking, Troy panics and flees the scene, leaving the girl lying unconscious in the street. Assuming she died, he spends the next few months agonizing over what he’s done. As it turns out, the girl, named Beatrice (Clea DuVall), survived the ordeal, though it did leave her emotionally scarred. Prior to the accident, Beatrice was an upbeat person who believed she was on this earth for a reason. After enduring so much pain, her faith is beginning to fade. Gene (Alan Arkin) is a manager for an Insurance company. One of his employees, Wade (William Wise), is always happy, which bothers Gene because his own life is in a shambles (he’s divorced, and his son is a drug addict). When the head office orders Gene to lay some people off, there’s little mystery as to who’s the first to go. Walker (John Turturro), a school teacher, is married to Patricia (Amy Irving), yet is also having an affair. One day, Walker is mugged on the street, and when his wallet is recovered and returned to his apartment, Patricia searches it and finds evidence of his infidelity. 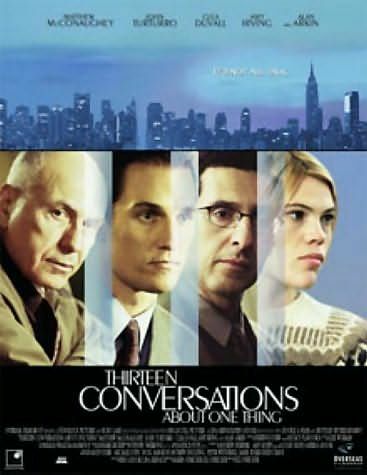 13 Conversations About One Thing is a well-crafted drama, featuring excellent performances from its impressive cast (McConaughey and Arkin are especially strong). What’s more, the movie is extremely loose with its timeline, rarely stringing its various stories together in chronological order. Actually, it wasn’t until later in the film that I even realized we were following these characters over the course of several months! Despite this, I never once felt out-of-sync with what was going on. Add to this the fact that each of the film’s storylines eventually connect with one another, and you have a stylish motion picture that also succeeds in capturing your undivided attention. Good choice, an excellent film that most people never even heard of and one that should have much more attention and glory given to it than fate has allotted it.